It has rained a lot lately as it usually does this time of the year in the Pacific Northwest. Our raingauge has collected 7.3" in 6 days and more rain is predicted through the week with possible let up by the weekend. The USGeological Survey Water data at Heisson bridge on the East Fork of the Lewis river in Clark County, Washington recorded: 4,020 CFS and a gage height of 16.59 at 1500 yesterday. The photos below show the difference a day makes after continous rain for 24 hrs. I stayed up this night watching the river rise, hoping that the rain would let up. The sound of the powerful river was like the roar of the large rapids that I remember while rafting the Colorado. Fortunately, the rain subsided by 20:00 and by 24:00 the river crested at 20 feet gage height, and 10,700 cfs. WHEW! Fortunately I recovered my beaver camera trap just in time. Thats a lot of water!! Glad it didn't get up to your house. Glad everything came out ok and looks like the next couple of days will stay dry enough to drain off some the the extra water. 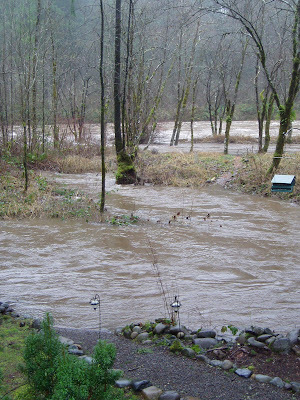 The Toutle stayed within the banks at my place, but was interesting watching the logs and debris roaring past the house.